Bukovje is a village along the road linking the town of Dravograd and the settlement of Trbonje, northeast of Dravograd, along the southern bank of the Drava River, in northeastern Slovenia. 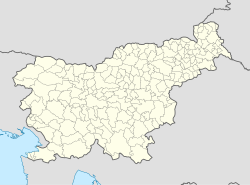 The village is part of the traditional region of Styria and is, as part of the Municipality of Dravograd, included in the Carinthia Statistical Region. It was established in 2004, when it ceded from the settlement of Otiški Vrh. Puchenstein Castle (Slovene: grad Pukštajn) on Pukštajn Peak (Pukštajnski vrh) dates to the 13th century. It was severely damaged in a 1706 fire. Only ruins have been preserved until today. The Baroque Puchenstein Mansion (dvorec Pukštajn) in the settlement dates to ca. 1710. Today, it is used for wedding ceremonies and as a cultural venue. The chapel of the mansion has been protected as a cultural monument. In Yugoslavia, it was used as barracks of the Yugoslav People's Army, and was owned by the Slovenian Ministry of Defence until 2008. ^ a b "Bukovje, Dravograd". Place Names (in Slovenian). Statistical Office of the Republic of Slovenia. Retrieved 19 June 2015. ^ "Puchenstein – Bukovje" (PDF). Carinthian Regional Museum. Retrieved 19 June 2015. ^ "7400: Bukovje pri Dravogradu - Kapela" [7400: Bukovje near Dravograd – Chapel]. Register nepremične kulturne dediščine [Registry of Immovable Cultural Heritage] (in Slovenian). Ministry of Culture, Republic of Slovenia. Archived from the original on 19 June 2015. Retrieved 19 June 2015. This article about the Municipality of Dravograd in Slovenia is a stub. You can help Wikipedia by expanding it. This page was last edited on 12 April 2018, at 13:29 (UTC).